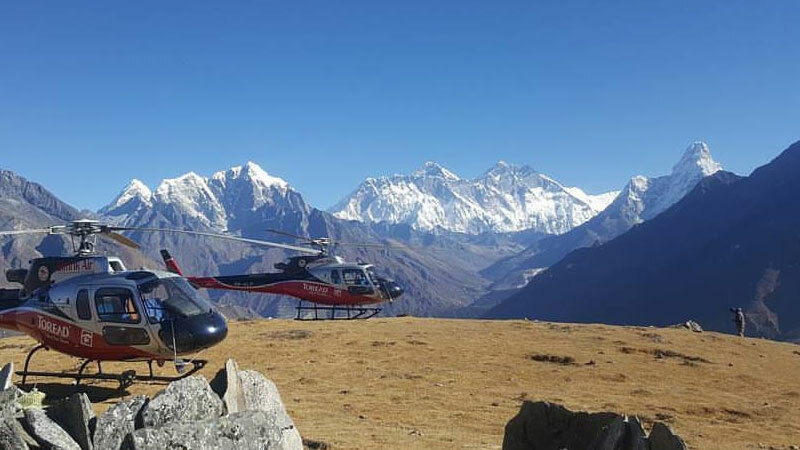 Mount Everest Base Camp Helicopter Tour furnishes your wish of being close to the base of world's tallest mountain, Mount Everest (Sagarmatha in Nepali) and stands face to face in just some hours of flight from Kathmandu. Yes, you will be at the base camp of Mt. Everest without walking for hours and spending weeks on challenging hiking. This incredible helicopter tour, of course, will cherish your beautiful eyes and refresh your mind finding yourself at the paradise of Himalayas, surrounded by the white lofty snow-capped Mountains. Everest Helicopter Tour definitely is the adventurous experience but some precaution must be taken as well. You will be flying from 1300 meters above sea-level to over the 5000 meters. Due to the lack of oxygen, it might become the life-threatening nightmare. But don't worry you are in a safe umbrella. We will be carrying oxygen together with very well trained guide. One of the best Ariel tours in the world, Everest Base Camp Helicopter Tour trip begins with 45 minutes of scenic flight to Lukla in the northeastern part of Nepal. Lukla popularly known as Tenjin Hillary Airport is the only one gateway to entire Everest Region Trekking and only one means of transportation of this region. We will pause the tour here for refueling the helicopter then fly to either Everest Base Camp or Kalapatthar. Chasing the Tengboche, Dingboche, Lobuche, and Gorakhsep, the helicopter will land at Everest Base Camp for short period of time to explore the surrounding landscape and capture some memorable pictures. Touching close the miraculous Mount Everest with your eyes fly back to Syangboche. Take the hot breakfast at Hotel Everest View and fly back to Kathmandu. Day 02: Everest Base Camp Helicopter Tour. Early morning pick up from the hotel and transfer to the Kathmandu Domestic Airport. Complete the airport formalities then fly to Lukla. After refueling fly either to Everest Base Camp or Kalapatthar. Explore the majestic mountains and fly back to Syangboche. Take breakfast at Hotel Everest View and fly back to Kathmandu. Transfer to the hotel and free time. Overnight at Kathmandu. You will have free time until 12 noon. After that check out from the hotel and transfer to the Kathmandu International Airport. It's time to say goodbye and bring a wonderful memory back to your home. Everest Base Camp Helicopter Tour finished here! Everest Base Camp Tour by chartered helicopter. Twin bed sharing hotel accommodation in Kathmandu. Kathmandu Sightseeing by private vehicle. Wants some modification on Everest Base Camp Helicopter Tour itinerary? contact us to customize it.